In 2013, ESA’s Planck mission unveiled a new image of the cosmos: the capture of microwave radiation generated at the beginning of the universe over the entire sky. This first light emitted by the universe offers a multitude of information on its content, its rate of expansion, and the primordial lumps, precursors of galaxies. The Planck consortium is publishing the full and final version of these data in Astronomy and Astrophysics on 17 July 2018. With its increased reliability and its data on the polarization of fossil radiation 1, the Planck mission corroborates the standard cosmological model with unequalled precision on these parameters, even if there are still some anomalies. For this work, the Planck consortium mobilized about three hundred researchers, notably from CNRS, CNES, CEA and several universities in France. Launched in 2009, ESA’s Planck satellite mapped the cosmological background, a microwave radiation emitted 380,000 years after the Big Bang, while the universe was reduced to a hot and almost homogeneous gas. Small variations in its temperature provide information about its contents, its rate of expansion and the properties of the primordial fluctuations that gave rise to galaxies. A first analysis of the data set was published in 2015, in the form of eight complete maps of the sky that included the polarization of the cosmological scattered background, which determines how, at the microscopic level, the waves that make up light vibrate. This crucial information bears the imprint of the last interaction between light and matter in the primordial universe, but its analysis was still only preliminary. The polarization of fossil radiation provides a signal 50 to 100 times weaker than its temperature and 10 to 20 times weaker than that emitted by the polarized emission of galactic dust. 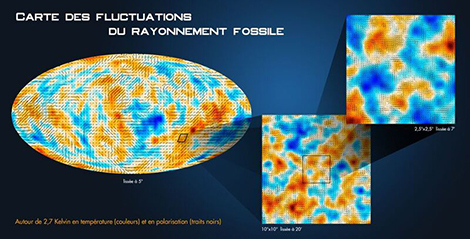 Thanks to the HFI (high frequency instrument), the Planck satellite nevertheless obtained a very precise map of the primordial polarization over the entire sky. This is a first, rich in lessons. Comprehensive, definitive and more reliable, the data published on 17 July 2018 confirmed the first results, very well described on the basis of ordinary matter, cold dark matter and dark energy of unknown nature, with an inflation phase2 at its very beginning. This cosmological model can now be derived using temperature or polarization data independently with comparable accuracy. This considerably reinforces the standard model of cosmologists, however surprising3. These results are distributed in about ten scientific publications, involving about three hundred researchers (see list of French laboratories involved below). However, some anomalies or imperfections remain. In particular, the rate of expansion of the universe differs by a few percent based on Hubble Space Telescope or Planck mission data. The question is open and many telescopes will now try to get to the bottom of the story. – APC, Astroparticle and cosmology (Université Paris Diderot/CNRS/CEA/Observatoire de Paris), in Paris. – IAP, Institut d’astrophysique de Paris (CNRS/Sorbonne university), Paris. – IAS, Institute of Space Astrophysics (University Paris-Sud/CNRS), Orsay. – Institut Néel (CNRS), Grenoble. – IPAG, Institut de planétologie et d’astrophysique (CNRS/Université Grenoble Alpes)4, Grenoble. – IRAP, Institut de recherche en astrophysique et planétologie (Université Toulouse III – Paul Sabatier/CNRS/CNES)4, Toulouse. – CEA-IRFU, Institut de recherche sur les lois fondamentales de l’Univers du CEA, Saclay. – LAL, Laboratory of linear accelerator (CNRS/Université Paris-Sud), Orsay. – LERMA, Laboratory for the study of radiation and matter in astrophysics and atmospheres (Observatoire de Paris/CNRS/ENS/Université Cergy-Pontoise/Sorbonne Université), in Paris. – LPSC, Laboratory of Subatomic Physics and Cosmology (Grenoble Alpes/CNRS/Grenoble INP University), Grenoble. – CC-IN2P3 of CNRS, Centre de calcul de l’Institut national de physique nucléaire et de physique des particules (IN2P3) du CNRS, Villeurbanne. Maps of the polarization direction of primordial light represented by rods whose length is proportional to the intensity of this polarization. In the coloured background are represented the temperature anisotropies. The map of the whole sky shows only the large scales. The two square maps are successive enlargements of the regions bounded by a black contour (around the southern ecliptic pole), which shows that Planck measured cosmological signals at scales much smaller than what is representable on a map of the whole sky. – Movies « Mission Planck » : 2013, images de l’Univers en formation, 2014, de nouveaux résultats, et Planck 2014, Voir l’invisible, produced par CNRS Images. 1 Polarization is a property of light, as is colour (or frequency) or direction of propagation. This property is invisible to the human eye but it is familiar to us (polarized sunglasses, 3D glasses in movies, for example). It tells us, in general, about the physical processes that gave birth to it. 2 Very brutal expansion to the very first ages of the universe during which lumps were generated. 3 95% of the universe consists of dark matter and energy whose nature is unknown. Researchers detect them only by its gravitational influence. The independent and crucial contribution of polarization is therefore welcome to better understand how the universe works. 4 IPAG is part of the Observatoire des sciences de l’Univers de Grenoble and IRAP is part of the Observatoire Midi-Pyrénées. Astronomy and Astrophysics, July 17, 2018.